The weekly roundup of top stories from the GFI Labs Blog – including news of a distressed traveler scam, Nigerian phishing scam, fake free VPN and .edu forum spam.. The weekly roundup of top stories from the GFI Labs Blog – including news of a new frequent flyer phishing scam and yet more rogue security products. The weekly roundup of top stories from the GFI Labs Blog – including news of yet more scams tied to social media. 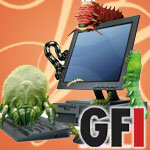 The weekly roundup of top stories from the GFI Labs Blog. This week they cover the next version of the Storm Worm, fake YouTube ads for the movie Tron, a golden oldie Nigerian 419 scam and two rogues, ProtectShield and Spyware Protection. Since last week the rogue security products (also called scareware) that we’ve posted on the GFI-Sunbelt Rogue Blog have had a new look. Instead of impersonating anti-virus products, these new ones are claiming to be applications that fix disk errors on a victim’s machine.